At Boerne Deck Builder, we strive to leave our clients with the Best-of-the-Best! Our Services are Professional and Top Quality, using the wood and stain of your choice. 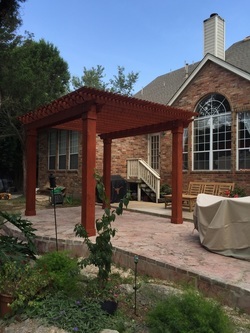 Although we named ourselves "Boerne Deck Builder," we certainly build a lot more than just decks. Here, we have a list of services we have to offer. And if you don't see your project on the list, just call us and we can discuss it. Our specialty is Unique and Custom Outdoor Hardscaping, so there is no job that we won't consider! We offer many cost-effective ways to finance your next Backyard Project to help you make your Dreams a Reality. • Hardscapes - Any physical building in your landscaping can be known as a Hardscape, and we can build it for you. • Decks - We build Raised-Decks and Low-Decks, which ever fits your home; as well as the most popular Deck around the Swimming Pool. • Gazebos - A beautiful place to have lunch or hold a wedding. Our Custom Gazebos are designed to be eye-catching! • Pergolas - Typically standing over your patio or deck, Pergolas offer shade and beautiful sunlight at the same time. • Screen Rooms - Your enclosed Patio can make for a great room to congregate, safe from the insects outdoors. • Patio Covers - Whether it be a Pergola, Full-Roof, or Cloth, we cover patios so you can enjoy outside even in no so pleasant weather. • Arbors - A Shaded Walkway, Bride and Groom's Vows, or a Grapevine Trellis, Arbors can be the perfect addition to your Landscaped Yard. • Pavilions - Our Pavilions have come in various custom sizes and shapes, but always make a beautiful and comfortable congregating area. • Privacy Fences - Replacing or adding a fence to your yard in Boerne? We will build yours to your specifications or as Unique as you'd like. Give on of our Builders a Call anytime at (830) 428-2999 and we'll help make your Dreams a Reality.